In complete chromosome complements there were always 6 chromosomes with a terminal Nucleolus organizing region (NOR). In most cases part of the NOR was decondensed, and several of this decondensed areas formed together a big collecting nuceolus (ger. Sammlenukleolus). 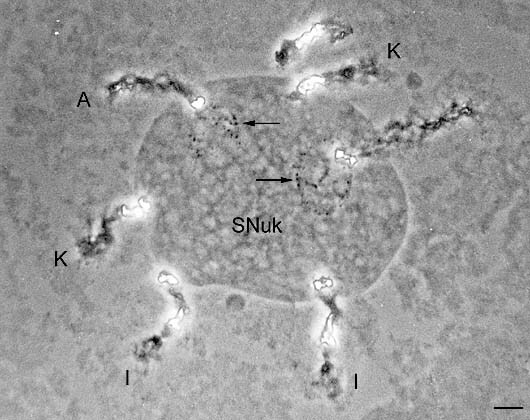 This collecting nucleolus was easily visible in phase contrast even without pretreatment due to its large size and particular structure (see figure A). The shape of the collecting nucleolus ranged from nearly circular to irregular. Instead of just one collecting nuceolus of 6 NOR there were also several smaller collecting nuceoli made up from the NORs of only 2 to 5 nucleolus organizaing (NO) chromosomes. Likewise could in a nucleus exist one or more smaller collecting nuceoli and single NO-chromosomes have its own nucleolus. But is was never been observed that all 6 NO-chromosomes had a separate nucleolus. Figure A: Collecting nucleolus (SNuk) made up by the NOR of 6 chromosomes (pair A, I and K). The small dot-like structures (arrows) are telomeric heterochromatin. Scale bar represents 10 µm. 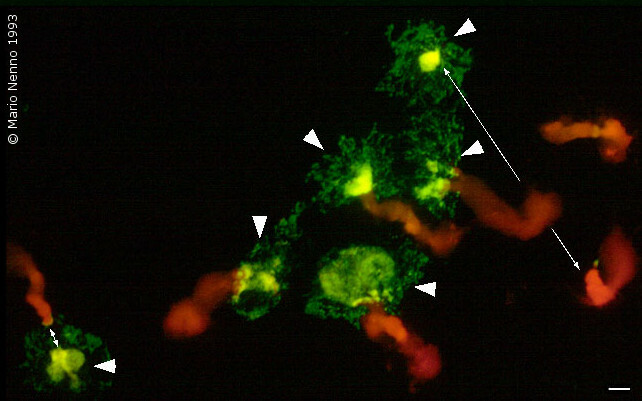 Figure D: The 3 pairs of NO-chromosomes (red) with loci of the ribosomal 18S-25S rDNA probe (yellow-green) corresponding to the NOR (arrow heads). Detached short arms are indicated by double-headed arrows. The scale bar represents 10 µm. 04/26/2019 2:52 Phaseolus polytene chromosomes by Mario Nenno. © 2008- All rights reserved.